Note that these figures do not include nameless NPCs, such as guards, bandits, etc. The Imperial population in all games and the Dunmer population in Morrowind would be significantly higher if these were included. 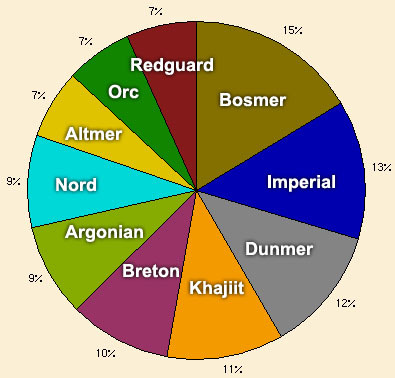 More detailed game-specific demographics can be found at Morrowind:Demographics, Oblivion:Demographics, and Skyrim:Demographics. 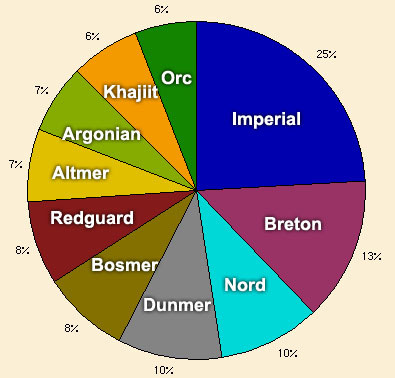 The area of each of Tamriel's provinces was first determined, to calculate roughly how the population is split among them. This of course assumes that all of Tamriel's population is equally dense in every province. This is one potential factor for error. When available, actual game data was used to determine the relative population-breakdowns of the provinces. It was assumed that the number of people you can meet in each game is only a representative sampling of the total number of people living in the province. 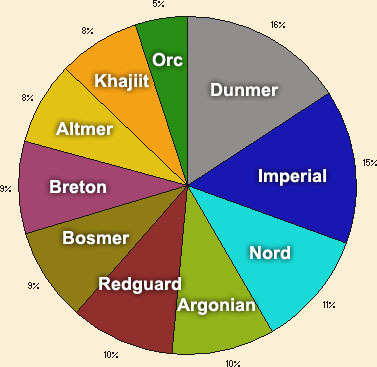 Thus, while there are over three times as many people in Morrowind as there are in Oblivion, the actual populations of Morrowind and Cyrodiil are guessed to be much closer in number, based on relative area. In the cases where no data was available, fake numbers were entered. The way these were determined was by sheer guesswork - that the representative race would account for approximately 55% of the population (which is close to correct in the known cases), and that the remaining 45% was divided evenly among the other races. This is another major leap of assumption, but lacking other sources of data, it was deemed justifiable. Orcs are likely under-represented. No data exists for Orsinium, which is a region of the Wrothgarian Mountains in High Rock. Additionally, in the earlier games, Orcs were treated as enemy creatures, not a playable race. This makes comparing their numbers considerably more difficult. Imperials are also under-represented. Morrowind, Oblivion and Skyrim had a substantial Imperial population in the form of unnamed guards and soldiers, which were omitted from the count. 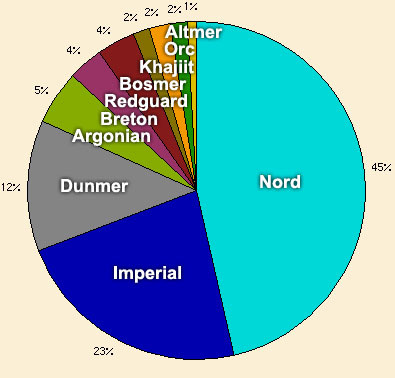 Also, it's likely that the Imperial population in the provinces without data is higher than reported, since Imperials rule Tamriel. 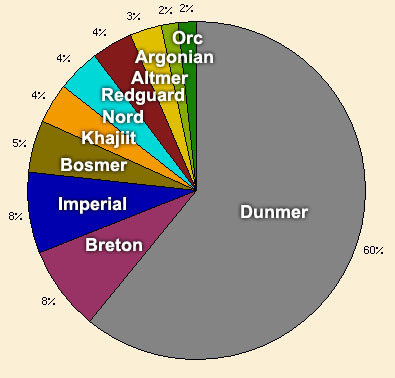 Dunmer are also under-represented. In Morrowind, as mentioned above, there was also a significant number of unnamed guards omitted from the count. 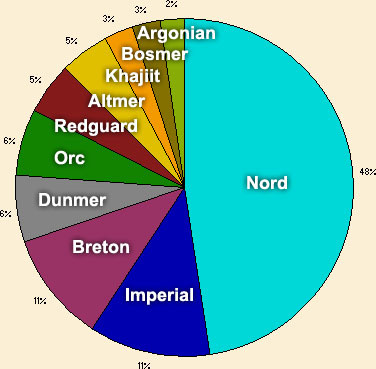 Nord data is also under-represented. Like the Dunmer in Morrowind, there were a significant number of unnamed guards and hunters in Skyrim. No data from Arena, Daggerfall, or Battlespire or any of the mobile games was available. How much these would skew the count is unknown. 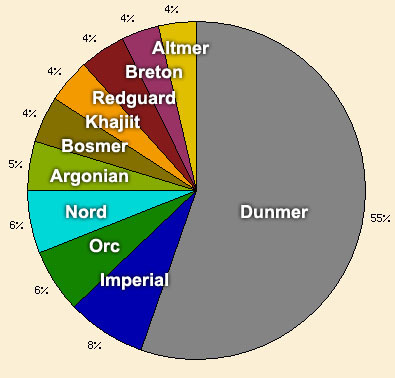 Data for the Black Marsh and Valenwood was extracted from the reading of books, guessing the total population based on the number of each race encountered in the story. This is by no means accurate, but without any other information, these were the best source available. Data for Hammerfell may be outdated, so to speak, as the game from which the population count was taken, Redguard, takes place in the 2nd Era, while Morrowind, Oblivion, and their respective expansions occur in the 3rd Era. To that degree, data from Skyrim would also be out of place here, though the difference of 200 years between Skyrim and Oblivion is shorter than the difference of 460 years between Redguard and Morrowind. Morrowind and Oblivion take place within six years of each other. This page was last modified on 13 April 2016, at 00:26.